Seems all the weight of the world is on Robin… or just all of Cassie’s weight. Good thing Anne’s around to lighten the load! Something which we can’t slither through, presumably. Hey! They’re only paying me scale! Yeah, with a length like that, she probably does weigh more than regular-form Cassie . . . So Cassie is the reincarnation of Cassandra the oracle. In some versions of the myth the first Oracle was Python’s mate, transformed into a human by Apollo. This, can’t possibly end well. 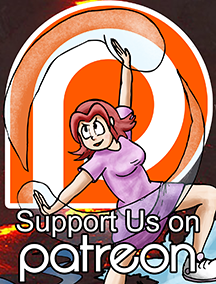 What happened with the early comic on patreon? Real life happened! I will put up something on Patreon about it, but I’ll make it up with some other things and try to get the next comic up there as soon as possible. Today’s forecast, it’s clear skies all around. Vipers drop fast, from planes to the ground. From Heavens above, down to Earth below. Is it true love, if a serpent falls for her beau? Like an ophidian snowflake, does she softly alight. Though crushed in her wake, I’m sure he’s alright. As a heart broken may mend, in joy and good cheer. Let fortune be thine, roll die now my friend. I get the feeling you’ve recently found and fallen in love with Rick Riordan’s books. Well, if you found anything to like about the movie, the books are better. Curious, whats with the constantly shifting art styles the last could of chapters? Out of curiosity, Anne Onymous is still alive and well, I presume? So much has happened throughout the years, I wonder how she’s doing in the real world. Is this a patron preview week? Yes it is! I’ll be posting that soon.